Now that the Meltdown and Spectre cats are out of the bag and patches are being issued left and right, the main question people have is: will this affect my everyday work? Intel’s latest performance metrics suggest that yes it might, but not too much — more so if, like me, you have an older processor. Intel’s Navin Shenoy released the results of several benchmarks done internally, and the performance hit from the deeply rooted processor problem disclosed by Google researchers is mercifully small for modern chips. But the biggest hit for those CPUs, and in fact most of the others as well, is on “responsiveness,” which according to the benchmark app’s creators includes “application launches, file launches, web browsing with multiple tabs, multi-tasking, file copying, photo manipulation, file encryption + compression, and background application installation.” So, pretty much all the stuff most people need to do. Gaming performance seems mostly unaffected, and with most GPUs affected in a more limited way or not at all by the exploits and their mitigations, gamers can probably rest easy. It’s those with older processors that may see a real slowdown — for example, the sixth-gen Core i7 6700K released in mid-2015. 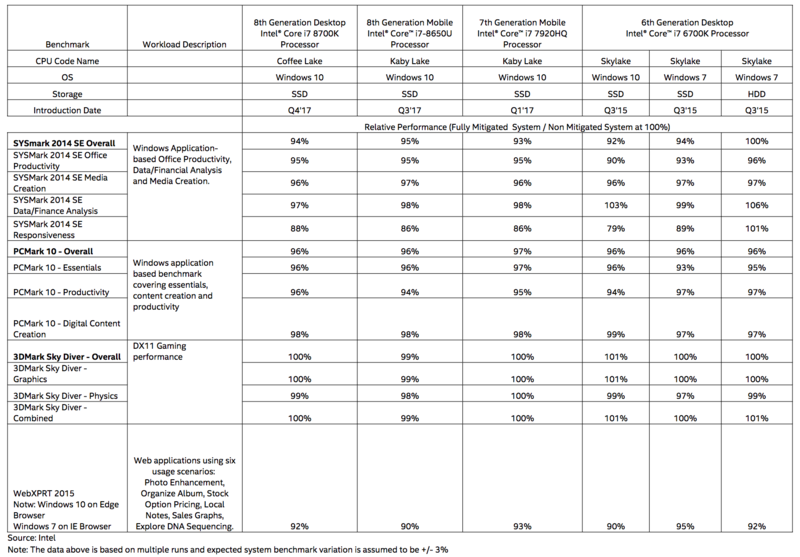 Its performance losses tip toward the 10 percent level, with responsiveness dropping 31 percent on Windows 10. Naturally, that’s my exact setup — and likely the setup of many a user who bought these extremely popular chips back then. This chart shared by Intel shows the raw numbers, as percentage of a chip’s unpatched performance. Older setups are possibly even more deeply affected, but we can wait for the results. The real risk with those chips is that they are in embedded or hard to reach systems that are difficult to patch, leaving them open to exploitation. So far there have been no reports of hackers taking advantage of any of these bugs, though — it’s not exactly script kiddie stuff. Strangely, in a few cases there are performance gains, though who knows how that came about. Shenoy doesn’t address this unexpected windfall, small as it may be. So if you notice your computer going slower in the next couple weeks, it’s not just you, and it isn’t a conspiracy by Apple — unfortunately, it’s a necessary consequence of the fix for Meltdown.